Udaipur is a beautiful city of lakes also known as “The Venice of the east”. Permanent campus of IIM Udaipur is located near Balicha in Udaipur. Every day is unique here in IIM Udaipur, as you’ll get to learn something new, interaction with faculties and peers, and hostel life where we learn and enjoy a lot. I would like to share my experience for a particular day in last monsoon season. I woke up early that day around 5 am, and I decided to start my day with jogging. I laced-up my shoes and started for jogging around our campus. Below is the picture which I’ve clicked that day, yes that’s how morning look like from our campus. I’ve got a positive start for the day. After coming from jogging I got ready and headed for breakfast. Then after having a tasty and healthy breakfast I headed for my classroom. Below is the picture of our classroom. Isn’t it beautiful? I had three lectures that day. In one of the lecture, I had to present a presentation also. I participated well in all the lectures, but here I would like to mention the lecture in which I’ve given the presentation. Before coming to IIM Udaipur, I had stage fear, and when it’s about giving a presentation in front of an audience of 60-70 people, your heartbeateat will go to the next level. One of our faculty told us it’s all because of an animal named as “panic monkey” which will create all this ruckus for us. If you can control that then you can do well, what you’ve to do is to pretend that you’re not afraid of facing any kind of audience. So, I thought of implementing the same on that day for my presentation. I went to present my presentation, and this time I was ready to pretend that I’m not afraid. It really worked for me, my presentation went well. I’ve learned a few more things that it’s all in your mind, which sometimes stops you from doing miracles in your life. We all have some fears, but running from those is not a solution. The more you’ll run, the more you’ll procrastinate, you’ll make your fears bigger and stronger. The solution is to face them and show what you got. For all this what we need is a proper guidance, which we’re getting here in our classroom sessions. Here at IIM Udaipur, faculties not only teach subjects, they share their relevant experiences which they’ve faced in the past. That’s why attending classroom sessions are more than learning a management subject. You’ll learn how you can simplify your life. 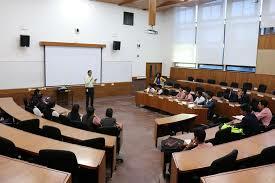 So, that was my experience of a classroom in IIM Udaipur. Hope you’ll find it useful, and will try to apply classroom learnings in real life to make it awesome. Adios. I would like to join “Aditya Birla Fashion & Retail Ltd (ABFRL)”. As I’m interested in working in the field of market research and knowing the consumer behaviour. As ABFRL is selling under its brands like Louis Philippe ,Allen Solly, Peter England and People via their individual brand stores and through other multi brand outlets. So it would be great if I’ll get a chance to study their market and getting the holistic view of Fashion & Retail industry. I ‘have learned various tools and technology in my PGP course like SPSS, R programming, BI tool (IBM Cognos), machine learning algorithms and statistical tools to study to market and consumers’ behaviour.